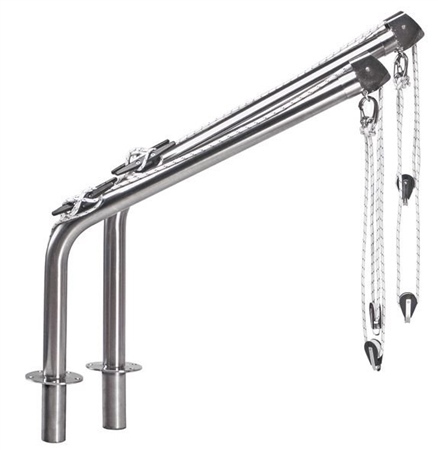 When used, these pivoting davits are blocked in a fixed position, determined when installing the davits (spacing between arms). When not in use, the arms swivel and can fold up for space saving on deck and transom. Easy flush mount installation thanks to mounting shoes. Supplied in pairs, complete with blocks and lines. Available in either 40mm Tube or 60mm Tube. 100 kg option comes with the following accessories: 2 blocks, 2 hooks, 2 x 3 m of rope. 160 kg option comes with the following accessories: 4 blocks, 4 hooks, 4 x 3m of rope.